It's Summer...time for a frozen cocktail? It’s Summer…time for a frozen cocktail? The warmer weather is upon us with increasing temperatures and more time spent outdoors. But what alcoholic ice lolly cocktails for grown-ups (or Poptails) are available in the market? LIC produces a range of frozen cocktails including Strawberry Daiquiri (pictured above), Pina Colada and their Mojito, which is available at Sainsbury’s in the UK for £2 each. Launched in 2014, POPS has a wider range available, including the world’s first Champagne ice popsicle. the ‘Classic’ (pictured above first from left). They also offer other cocktail flavours such as the Bellini, the Frose and Watermelon Martini, as well as some non-alcoholic options. POPS has also innovated by launching the PIMM’S ice popsicle (pictured above) which is available online through Ocado in the UK along with the whole POPS range, at £2.50 per popsicle. 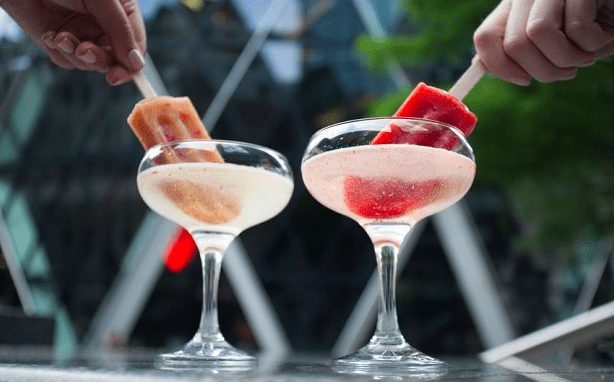 Fortnum & Mason in Piccadilly, London has on offer an upmarket Frozen Champagne popsicle proposition (pictured above) available online at £2 per unit. The discount supermarket chain ALDI also has their own alcohol ice popsicle product on offer, with a Gin & Tonic variant (pictured above) and also a Prosecco & Beach Bellini, both available at 50p per unit. Fruta POP int the US produces a variety of flavours including Sparkling Lychee Prosecco, Moscow Mule and Cranberry Mojito with prices varying at around $5 per popsicle (depending on size of pack selected). SnoBar in the US sells alcoholic ice-pops (and ice-creams) in a variety of different flavours and through the off-trade and on-trade channels as the self-entitled ‘the original frozen cocktail’ (below). Buzz Pop alcoholic popsicles (Adult Push-Pops) was launched in Las Vegas US and contains the equivalent of one drink with a strong 15% abv per popsicle. They are a premium proposition with all-natural, gourmet sorbets made exclusively with fresh fruits and premium liquors. Some of the flavours available can be seen pictured below. Other international markets are also joining in the frozen cocktail trend with South Africa’s Frost Popsicles launching a range of different flavours such as the Gin & Tonic Berry Infusion (pictured below). Alcohol infused popsicles are also available in Australia through iycpop on a variety of flavours (below). It seems that the trend for Poptails started a few years ago has also meant that some brands and products have come and gone and are no longer available: Icycl vodka ice pops (below), were available online in fruity flavours such as Apple, Blackcurrant and Lemon & Lime through Firebox.com but currently are not available for orders. Another such example was a product from the UK supermarket Tesco (pictured below). This has also meant that new poptail brands and flavours are entering the market. Inspired by popular cocktails, one such example comes from Hackney-based vegan sorbet manufacturer LAPP, who have released some Whisky and Prosecco poptails in 2018 (LAPP poptail range pictured below). Finally, if you prefer to make your own, there are lots of homemade recipes online such as one for Baileys poptail and other examples from this website. Note that I have excluded the alcoholic cocktail ice pouches from this list, which are available through most supermarkets from different brands.